Butterfly Sriver is the most popular and also most successful Butterfly’s table tennis rubber over the decades. Almost a hundred of table tennis players have won their major Championship titles with Sriver. The great mix of hard and spinny surface enhances the balance between spin and speed. 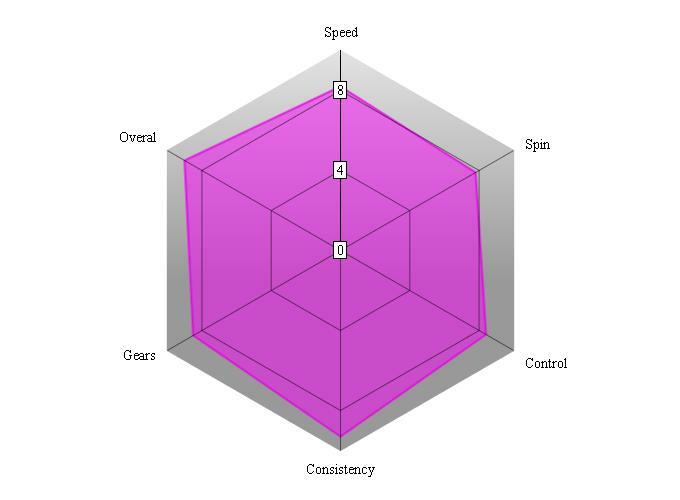 It comes with all gears that enable word class players to produce a huge range of spin and speed. 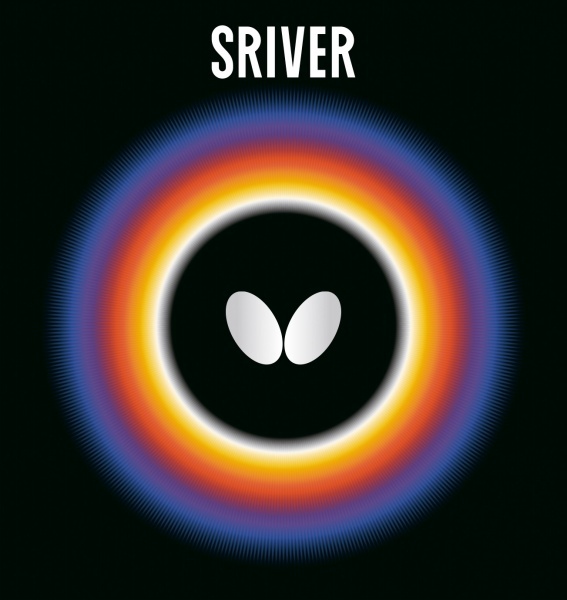 Sriver is one the benchmark for table tennis rubbers for the last 30-odd years. This isn’t certainly by fluke as it was considered the fastest rubber around with good control. Great players like Timo Boll remains a fan for a good reason as this rubber alone has helped many players to become champions. Note: The graph reflects real users experience which may not be identical to information from the manufacturer. The excellency of Butterfly Sriver has been proven for many decades from beginners to world-class levels. Its popularity is arguably on par with the classic Yasaka Mark V. It is flexible all round table tennis rubbers with extremely cost-effective price. It is arguably one of the most durable table tennis rubber that potentially last long over many years. Even though it is not the best for speed nor spin, it offers you super easy controllability with a wide range of gears allowing you to perform various technique from close to far distances. The Butterfly Sriver also shines on smash, block, counter-attack, backspin and all key techniques. In addition, it is very forgiving table tennis rubbers allowing beginners to returning the ball nicely even with imperfect techniques or strokes. However, this rubber may not be the best for very offensive players since there are various more powerful rubbers in the markets, such as Butterfly Tenergy series. It is recommended for all-round players from beginners to advance levels. This post is a review of the original Butterfly Sriver table tennis rubber. You can get this rubber from Megaspin. Players who look to attack the ball with speed and spins without compromising the paddle’s control. This rubber responds very well when speed glued. If you are a defensive player and want to retain some attacking capabilities, you will find that the Sriver 1.0-1.5mm does the job perfectly. The rubber has excellent control with an added oomph to it when needed. Players looking to generate extreme topspin and backspin. The Sriver rubber is more of an all-round offensive rubber with good balance therefore if you are also looking for extreme speed, you will need to look elsewhere. The Sriver is considered as a middle of the range table tennis rubber. The top sheet is less grippy and tacky than the Mark V. The top sheet and sponge is a little softer than the Mark V but remains fairly firm. In terms of weight, the Sriver feels a little lighter than the Mark V and this gives the Sriver good mechanical spin. “Sounds like a good choice of equipment. Sriver L is heavier than Mark V but EL and FX are slightly lighter. Sriver L is a firm sponge, EL Medium firm, and both harder than Mark V which is also a medium firm. Mark V has a bit more dwell time for loops and a higher throw angle than Sriver L and EL. Sriver in 2.0mm or thicker has very good control with a decent amount of speed and spin. Great for looping against backspins or to block. Good technique is required for counter-looping. The Sriver is better suited for blocking than the Mark V but less powerful. When used with speed glue, the rubber goes in rage mode lol. You retain your control but will you will now have at your disposal some serious power to unleash powerful drives and loops with added spin and speed. The throw angle is lower than the Mark V so you can hit some low bullets from topspin balls. The thinner sponges tend to have excellent control and adequate spin. Sriver is one of the best rubbers for an all-round player who wants a mixture of defense and attack. There are faster rubbers available in the market due to the advances in rubber technology but the Sriver rubber provides you with a mixture of speed, control, power and spin that a very few rubbers can compete with. No wonder the Sriver has remained so popular with top players for the last 30 years. We all know how consistency plays an important part in the success and if you decide to go for the Sriver rubber, you will enjoy it for years to come because of its longevity and ease of use. 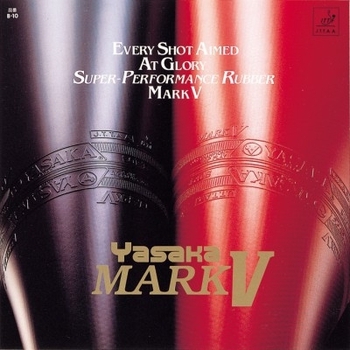 More information on Butterfly Sriver and Yasaka Mark V rubber.